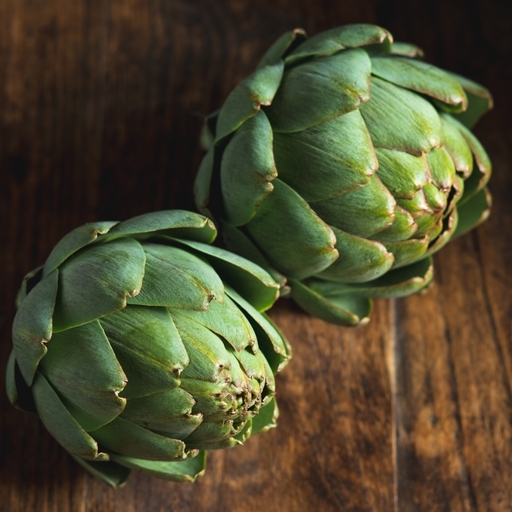 Many farmers have a passion for one particular crop that surpasses rational consideration: for Guy it’s globe artichokes. They have a magnificent towering sculptural form in the field, a rich, meaty flavour – and you don’t have to bend to pick them! Relish these treats slowly, leaf by leaf, or cut out and braise their delicate hearts. Boil whole in salted water with some lemon juice, then relish leaf by leaf with melted butter, mayonnaise or vinaigrette, until the meaty heart is revealed. Keep for up to a week in the bottom of the fridge. Harvested late May to late July - smaller heads from new plants in Sept/Oct. Ours were bred from French stock, imported by Guy Watson and his dad in a rowing boat from Brittany. If you leave globe artichokes to grow they will open into the purple flowers sold in dried flower shops. They're a great thing to grow where rabbits are a pest, as rabbits just won't touch them.